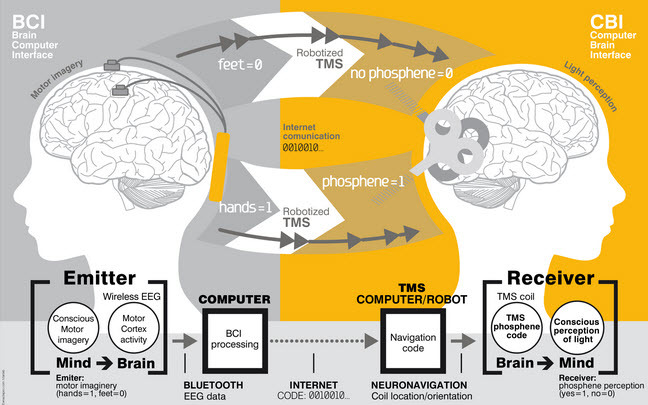 An international team of neuroscientists and robotics engineers have demonstrated the first direct remote brain-to-brain communication between two humans located 5,000 miles away from each other and communicating via the Internet, as reported in a paper recently published in PLOS ONE (open access). In India, researchers encoded two words (“hola” and “ciao”) as binary strings and presented them as a series of cues on a computer monitor. They recorded the subject’s EEG signals as the subject was instructed to think about moving his feet (binary 0) or hands (binary 1). They then sent the recorded series of binary values in an email message to researchers in France, 5,000 miles away. There, the binary strings were converted into a series of transcranial magnetic stimulation (TMS) pulses applied to a hotspot location in the right visual occipital cortex that either produced a phosphene (perceived flash of light) or not. “We wanted to find out if one could communicate directly between two people by reading out the brain activity from one person and injecting brain activity into the second person, and do so across great physical distances by leveraging existing communication pathways,” explains coauthor Alvaro Pascual-Leone, MD, PhD, Director of the Berenson-Allen Center for Noninvasive Brain Stimulation at Beth Israel Deaconess Medical Center (BIDMC) and Professor of Neurology at Harvard Medical School. A team of researchers from Starlab Barcelona, Spain and Axilum Robotics, Strasbourg, France conducted the experiment. A second similar experiment was conducted between individuals in Spain and France. “We believe these experiments represent an important first step in exploring the feasibility of complementing or bypassing traditional language-based or other motor/PNS mediated means in interpersonal communication,” the researchers say in the paper. “Although certainly limited in nature (e.g., the bit rates achieved in our experiments were modest even by current BCI (brain-computer interface) standards, mostly due to the dynamics of the precise CBI (computer-brain interface) implementation, these initial results suggest new research directions, including the non-invasive direct transmission of emotions and feelings or the possibility of sense synthesis in humans — that is, the direct interface of arbitrary sensors with the human brain using brain stimulation, as previously demonstrated in animals with invasive methods. “The proposed technology could be extended to support a bi-directional dialogue between two or more mind/brains (namely, by the integration of EEG and TMS systems in each subject). In addition, we speculate that future research could explore the use of closed mind-loops in which information associated to voluntary activity from a brain area or network is captured and, after adequate external processing, used to control other brain elements in the same subject. This approach could lead to conscious synthetically mediated modulation of phenomena best detected subjectively by the subject, including emotions, pain and psychotic, depressive or obsessive-compulsive thoughts. This work was partly supported by the EU FP7 FET Open HIVE project, the Starlab Kolmogorov project, and the Neurology Department of the Hospital de Bellvitge. As a researcher in the field of mHealth & mental health, I welcome the "Green Paper on Mobile Health" recently published by the European Commission. I believe that this document can provide a useful platform for discussing key issues related to the deployment of mHealth, thereby contributing to bridge the gap between policy, research and practice. Actually, according to my experience, citizens and public stakeholders are not well-informed or educated about mHealth. For example, to many people the idea of using phones to deliver mental health programs still sounds weird. Yet the number of mental health apps is rapidly growing: a recent survey identified 200 unique mobile tools specifically associated with behavioral health. These applications now cover a wide array of clinical areas including developmental disorders, cognitive disorders, substance-related disorders, as well as psychotic and mood disorders. First, mobile apps can be integrated in different stages of treatment: from promoting awareness of disease, to increasing treatment compliance, to preventing relapse. Furthermore, mobile tools can be used to monitor behavioural and psychological symptoms in everyday life: self-reported data can be complemented with readings from inbuilt or wearable sensors to fine-tune treatment according to the individual patient’s needs. Last - but not least - mobile applications can help patients to stay on top of current research, facilitating access to evidence-based care. For example, in the EC-funded INTERSTRESS project, we investigated these potentials in the assessment and management of psychological stress, by developing different mobile applications (including the award-winning Positive Technology app) for helping people to monitor stress levels “on the go” and learn new relaxation skills. In short, I believe that mental mHealth has the potential to provide the right care, at the right time, at the right place. However, from my personal experience I have identified three key challenges that must be faced in order to realize the potential of this approach. I call them the three "nEEEds" of mental mHealth: evidence, engagement, enactment. Evidence refers to the need of clinical proof of efficacy or effectiveness to be provided using randomised trials. Engagement is related to the need of ensuring usability and accessibility for mobile interfaces: this goes beyond reducing use errors that may generate risks of psychological discomfort for the patient, to include the creation of a compelling and engaging user experience. Finally, enactment concerns the need that appropriate regulations enacted by competent authorities catch up with mHealth technology development. Being myself a beneficiary of EC-funded grants, I can recognize that R&D investments on mHealth made by EC across FP6 and FP7 have contributed to position Europe at the forefront of this revolution. And the return of this investment could be strong: it has been predicted that full exploitation of mHealth solutions could lead to nearly 100 billion EUR savings in total annual EU healthcare spend in 2017. I believe that a progressively larger portion of these savings may be generated by the adoption of mobile solutions in the mental health sector: actually, in the WHO European Region, mental ill health accounts for almost 20% of the burden of disease. For this prediction to be fulfilled, however, many barriers must be overcome: thethree "nEEEds" of mental mHealth are probably only the start of the list. Hopefully, the Green Paper consultation will help to identify further opportunities and concerns that may be facing mental mHealth, in order to ensure a successful implementation of this approach. ETH-Zurich biotechnologists have constructed an implantable genetic regulatory circuit that monitors blood-fat levels. In response to excessive levels, it produces a messenger substance that signals satiety (fullness) to the body. 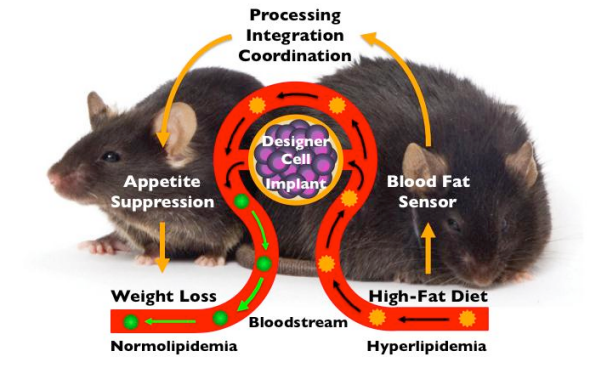 Tests on obese mice revealed that this helps them lose weight. A new signal processing algorithm that enables any pair of earphones to detect your pulse was demonstrated recently at the Healthcare Device Exhibition 2013 in Yokohama, Japan. The technology comes from a joint effort of Bifrostec (Tokyo, Japan) and the Kaiteki Institute. It is built on the premise that the eardrum creates pressure waves with each heartbeat, which can be detected in a perfectly enclosed space. However, typically, earphones do not create a perfect seal, which is what gives everyone in a packed elevator the privilege to listen to that guy’s tunes. The new algorithm allows the software to process the pressure signal despite the lack of a perfect seal to determine a user’s pulse.